April 13, 2017 / Modified apr 14, 2017 1:18 p.m.
Not far from my mailbox, a coyote was avidly digging for treasure. Pushing rocks aside with its paws and snout, Coyote hesitated when he me saw me, circled, walked away. Desire won, and the animal returned to digging. I knew what was underground, near the prickly pear cactus, though I hadn’t seen any round-tailed ground squirrels yet this season. They hibernate for the winter and were just waking up. Coyote could smell them and was tunneling into their sleepy-time burrows for a yummy snack. Scent is a primary element to negotiating the animal world. We humans miss out--with our noses so high off the ground, our sanitation, our aggressive campaign to deodorize the world. What was so alluring that coyote continued to dig even as I stood watching? When male squirrels wake up—earlier than the females—they defecate and urinate. Females, who have dug their own burrows, go into estrus—the time they are ready to breed--sending out pheromones. Mmm-mm, smells good to Coyote. But as fast as Coyote dug, so deep his head disappeared from my sight, he came up empty, finally gave up, and trotted away towards my neighbors and their roaming cats who have miraculously avoided the flying, running, slithering predators in our hood. The next day, I saw one rather dazed looking squirrel above ground near the crater the coyote had left. Usually, these little squirrels will quickly run and dive into the nearest hole. It could be one of their own, or one made by a lizard, or a snake—oops. Then they peek out to see if I’m still there. Not this one, who wandered around like a drunk way over the limit. If there was a female round-tailed ground squirrel in that burrow, Coyote is not the prince our sleeping beauty waits for as she wakes up. The digger is supposed to be an eager male squirrel freeing her so they can mate on the one day she’s at peak fertility. Yes, one day. All year. Think that coyote’s eager? Imagine the male squirrel, who has gone to ground before the female and is waking up looking for his one shot at the primal dance… I mean, procreation, not nurturing fatherhood. An expectant mother surveys her neighborhood. These squirrels, who look like miniature prairie dogs, are not social creatures, despite the appearance of communal living. Males will go into hibernation later in the summer, before the females, who will be raising litters of 8-10 offspring. The kids play, but once the young are old enough, they leave. And if you see round-tails in the fall, it’s most likely youngsters. What these squirrels will do is make warning calls to each other when there’s danger. They’ll gang up on a snake to divert it. 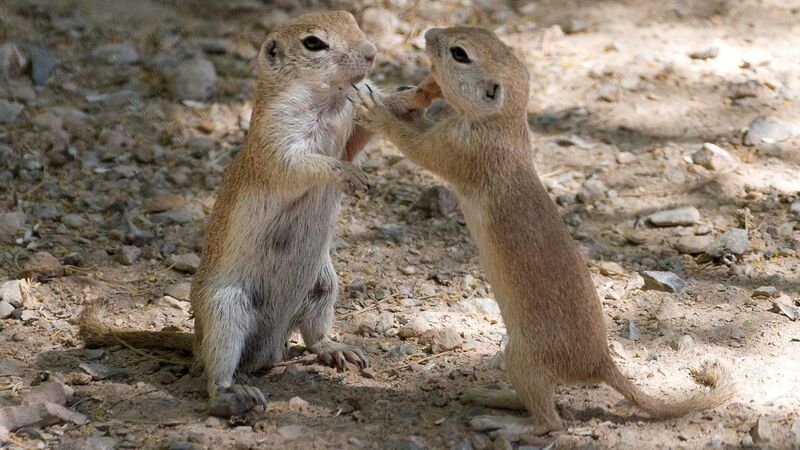 Two ground squirrels standing on their hind legs, in this case a mother and her offspring. Their diet is primarily vegetation—cactus, mesquite pods, seeds--and insects, but I had witnessed a round-tail squirrel eating road kill of its own kind, which did lower the cuteness quotient. I had questions and I love talking to people who devote much of their time to particular species. So I put out a call to the [National Phenology Network}(https://www.usanpn.org/) , asking for a squirrel expert. That led me to John Koprowski, Professor and Associate Director of the School of Natural Resources & the Environment at the University of Arizona. He studies squirrels around the world. Turns out these common squirrels have yet to be focused on as much as the other two Arizona species—antelope squirrels and rock squirrels. 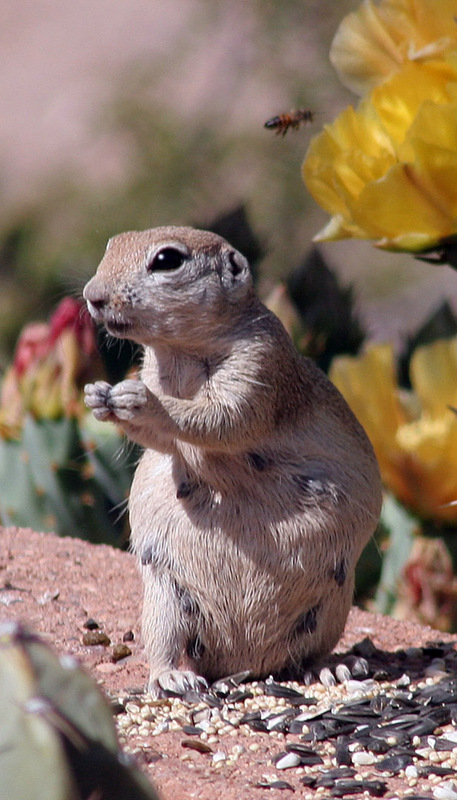 Even though Professor Koprowski described round-tailed ground squirrels as “the neighbor we know so little about,” he knows a lot. Round-tailed ground squirrels are themselves a source of a large amount of food to raptors, mammals, and snakes. Squirrels also move soil and disperse seeds. When you add up these benefits, the pest moniker doesn’t really apply. That doesn’t mean I want them in the house. 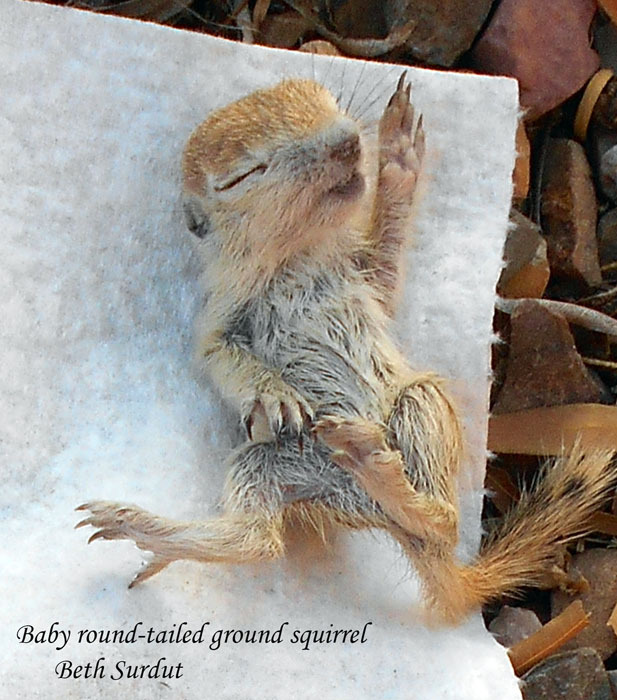 Last year, in the spring, I found a baby round-tailed ground squirrel lying on its side on my kitchen floor. It looked stiff, eyes closed, unmoving. I thought it was dead, but when I picked it up in a paper towel, the squirrel was breathing. No marks, no blood, so I took it outside and sat with it in my lap, just watching. It flailed and I realized that one leg was broken at the hip—poor little leg just flopped. The squirrel squinted, reached up, and touched my finger, barely grazing his claws on my skin. Then it collapsed. No hope for this precious one. You know that feeling when you sense someone’s watching you? The next day, I looked down from my work table to see another baby squirrel looking up at me. The screen doors were closed, but there’s a small gap between the wood door jamb and the metal doors. It’s barely as wide as my little finger, but these acrobatic creatures are not only flexible, they can also stretch their skins. Perhaps this route is how the first one broke its hip, but the one sitting on her haunches was perfect. She stared at me with eyes black and shiny as obsidian, her ears like cropped rosettes. Her fur was the muted color of desert earth and clouds Before we started the chase that could only end with the cat, or my setting out fruit and nuts in a humane trap, I dropped a container upside-down over her, slid a piece of stiff paper under her and took her outside. Baby scampered away. NOTES: In the book Our Desert Neighbors, written in 1950 by Edmund Jaeger, the author referred to these squirrels as Citellus territicaudus neglectus. It seems an appropriate tag for these busy little bodies that haven't been studied much, but I noticed a different designation in current descriptions. 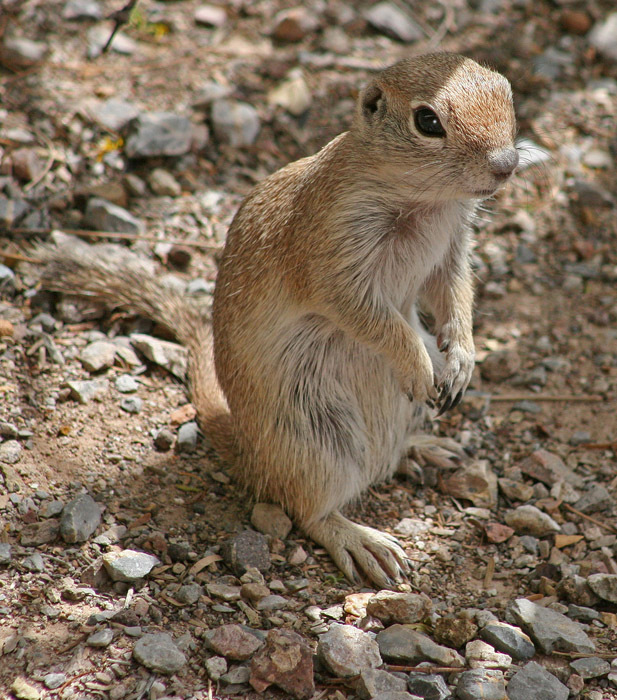 According to Professor Koprowski, the name of the round-tailed ground squirrel was recently revised by scientists to Xerospermophilus tereticaudus neglectus – the neglectus portion is the subspecies and is often left off. "Round-tailed" refers to the circumference and "ground" refers to their burrows. The solo exhibition of the drawings and stories of The Art of Paying Attention will be at The Ranch House Gallery at Agua Caliente Park from April 15 to May 10. 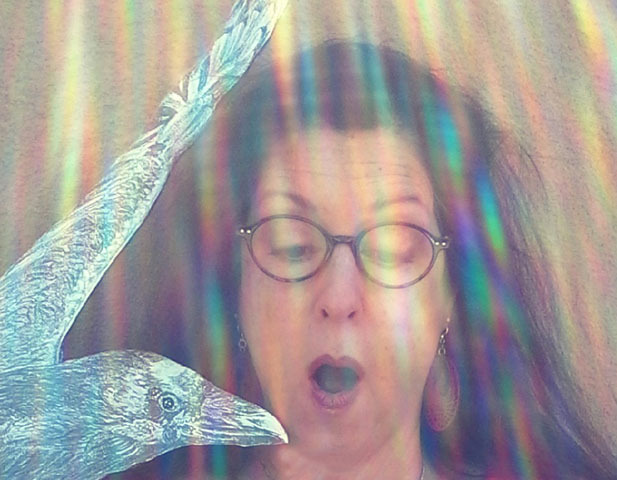 It presents a unique opportunity for AZ Spotlight listeners to see her illustrations of the animals she talks about. 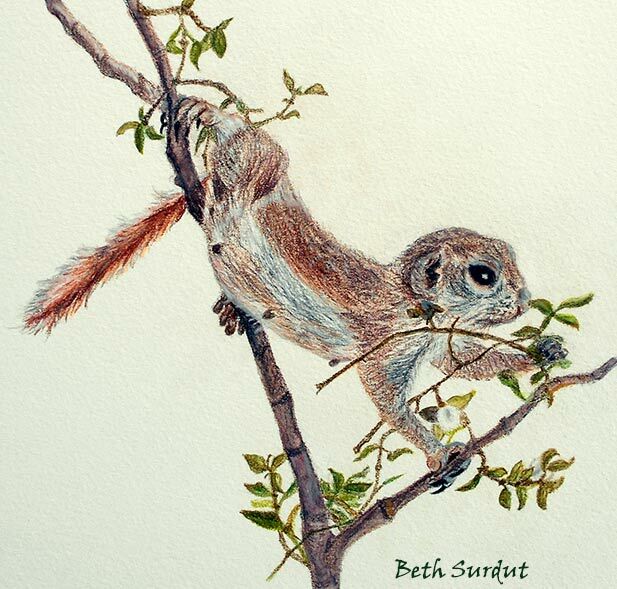 During that time, other than the scheduled reception and workshops listed below, Beth will be there often during gallery hours, working on drawings and new critter stories. In April, hours are Wednesday through Saturday, 10 am - 3 pm and in May, Tuesday through Saturday, 9 - 2. The Reception is Sunday April 30, 10 am - noon. Under the aegis of the National Phenology Network, Beth Surdut is hosting two Paying Attention workshops at Agua Caliente Park Sunday, April 23, 9 am - noon and Wednesday, May 10, 8 am - 11 am. Advanced registration required.